Thank you all so much for you super kind words about my cardigan! I can't tell you how happy it made me feel hearing (reading) everything you guys had to say about it. You're all so nice! My Spring Break sort of came and went and I didn't get much knitting done while I was at home. This was mainly because the only project I brought home was the lace shawl for my LYS. I was on campus for the beginning of break because I was going to go to Chicago a few days into it to see the London Symphony Orchestra (they were breathtakingly unbelievable!!!) and campus is closer to Chicago than my home is. Anyway, with the help of Netflix and my small collection of what I call "knitting movies" (you know, the ones that go on forever and you can knit happily while watching them because you know them so well. Pride and Prejudice, The Sound of Music, those types...), I was able to get about half of the shawl done, but I haven't looked at it since. I'm a terrible person. After a week at home without knitting (yes, I had the option, but I didn't do it), I really felt the urge to throw some yarn on the needles immediately when I got back. I knew I had wanted to use this yarn for a small triangular shawl, I just couldn't decide which one. 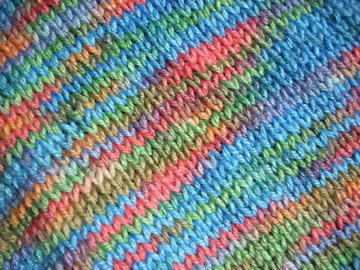 The yarn is a hand-dyed hank of knitpicks bare sock yarn that I got as part of a yarn swap. I finally decided on Ishbel by Ysolda Teague (it's now part of her Whimsical Little Knits Collection). 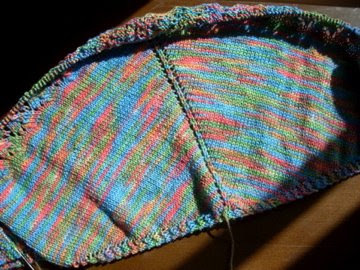 The stockinette portion allowed the hand-dyed quality of the colors to take center stage, but the lace section will still give me something interesting to do. I'm really loving how the colors are knitting up. The colors of this yarn are so bright, it makes me very happy. It has been a while since I have knit with yarn with any color intensity (a grey sweater, a brown sweater, a tan shawl...), so this was very exciting for me. I've just started the lace section and although each row gets longer, the fun of seeing what the next row will add to the pattern really makes knitting this shawl a lot of fun. Hmmm... what to do with it when I finish? The colours are beautiful. I think you chose the perfect pattern to show them off. Oooh, I love that Ishbel. 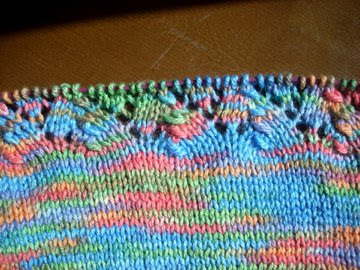 Such a great pattern, and it is looking good in that pretty hand-dyed. Nice to take a break from neutrals, isn't it? Pretty pretty. Those colors and LSO! Saw them live in London and was besotted. See? You were just waiting for Spring to start knitting with some color :) Looks great! When I get color-deprived, I start crocheting multi-color granny squares, and then join 'em all together in an afghan or something. You can really overdose on color that way though, lol!